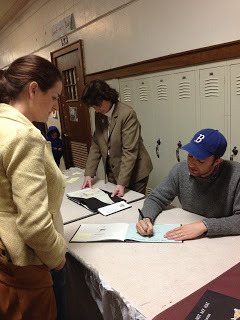 Jon Klassen & Lemony Snicket Event! Last night I went with two of my picture book critique partners to see Jon Klassen and Lemony Snicket speak about their new book The Dark. It was hands down the best author/illustrator presentation I have ever seen! It’s so rare to get to see both the author and illustrator together, and these two played off each other so well. The highlight for me was watching a blindfolded Klassen illustrate The Dark on an easel as Snicket was reading aloud, it was hilarious. These two will be touring to a few more cities and if you are lucky enough to have them head your way, make sure you don’t miss out!! !